along—stubborn people who weren’t afraid to be heard. That puts Yamaha in the position of offering two completely different 250cc off-road bikes for the same purpose. 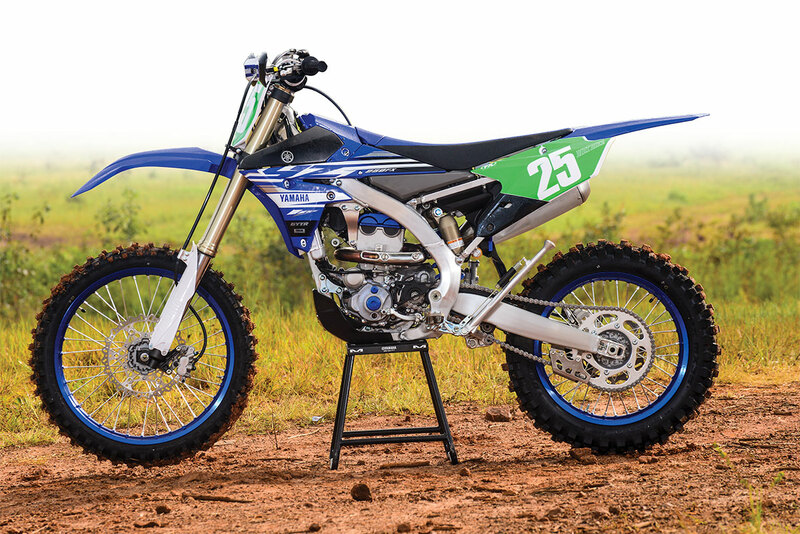 The YZ250FX four-stroke is based on the previous generation of YZ250F motocross bikes but with electric start, a six-speed gearbox and off-road paraphernalia. The YZ250X is also based on an older MX bike—a much older MX bike—and it has a wide-ratio five-speed gearbox, a re-tuned power delivery and the same off-road fluff. 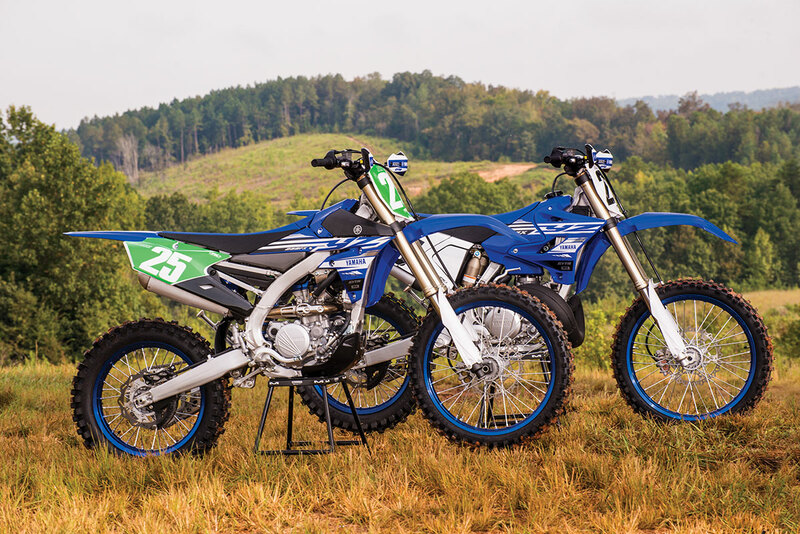 Both bikes are imported under rules stating that they are closed-course, competition bikes, and both bikes are legal for the same class in venues like GNCC, WORCS and Big 6. So, once again, we get to ask the eternal question: which is better, four-stroke or two-stroke? In 2015 Yamaha created the 250FX from the then-current YZ250F motocross bike. The MX bike was on top of its game at the time. In the motocross world, the YZ had won pretty much every shootout since it got the rearward-tilted cylinder and fuel injection. To make it into an off-road bike, Yamaha engineers concentrated on things that owners couldn’t do on their own. It got a sixth gear added to the gearbox and electric start. Remember, in 2015, electric-start motocrossers were not the norm. Yamaha also gave the FX softer suspension, an easier clutch pull, a different power delivery, a kickstand and an 18-inch rear wheel. The bike was not burdened with EPA noise or emission equipment. It was no quieter than the motocross bike, and it did not have a spark arrestor. To fill that void, Yamaha released the WR250F. The YZ250FX did not get a larger fuel tank, either, but the motocross model already had the biggest fuel tank of all the bikes in its class at 2 gallons. We can’t explain it, but suspension always works better on a four-stroke, all other things being equal. The next year, Yamaha shaved off a little weight by removing the kickstarter. The YZ would start with the button only, although there was a theory that riders could buy the kickstarter, shaft and gears to restore the kickstarter as a backup. In the real world, very few riders did that. That brings us to the 2019 model, which has no changes. It still weighs 239 pounds without fuel. But, the bike seems a little more dated because of the release of an all-new 2019 YZ250F motocross bike. The new MXer was designed from the outset with electric start and is much lighter than the FX as a result. Will riders be drawn to the MX bike for off-road use? Maybe, but the gas tank capacity is much smaller. To build the YZ250FX, Yamaha started with the MX bike and made changes that the buyer could never accomplish. At the top of the list are the electric starter and the six-speed gearbox. This bike is more of a philosophical triumph than a technical one. The YZ250 motocross bike was once the kingpin of Yamaha’s off-road line, but we all know what happened. We embraced the coming of four-strokes until we realized that they cut deeply into the sales of the bikes that we held dear. Thus, the Honda CR250R, the Kawasaki KX250 and the Suzuki RM250 all were dropped in the mid 2000s. The Yamaha YZ250 was the best of those, anyway, so if we only got to keep one Japanese two-stroke 250, it was the right one. 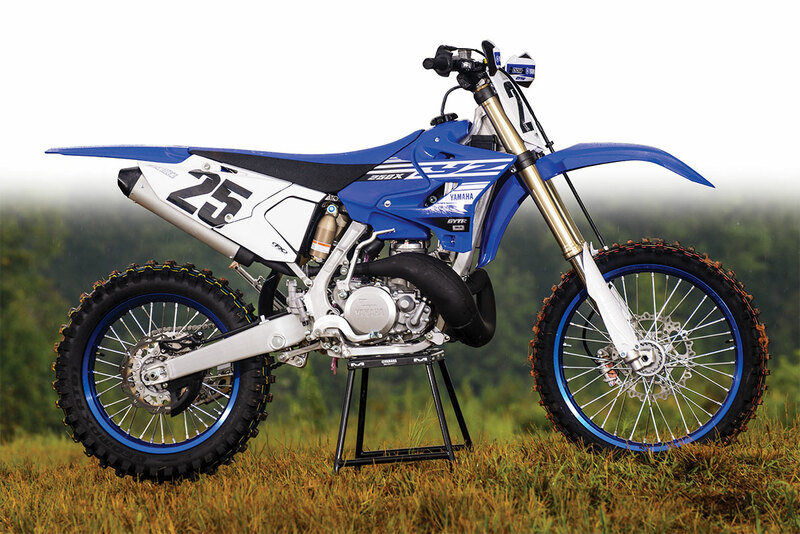 The YZ250X two-stroke has big advantages in power and weight—still. The YZ got minor, sporadic updates for 10 years, but you would be hard-pressed to tell the difference between a 2005 model and a later one. Then the X arrived in 2016, and the stubborn two-stroke lovers within Yamaha chalked up a big victory. Even so, Yamaha was very careful not to invest in much new tooling for the bike. A mold for a larger fuel tank was rejected. Instead, the bike got a wide-ratio gearbox because Yamaha was able to re-purpose some existing part numbers. Several of the gears were straight out of a 2002 YZ426F. An electric start would have been nice, but that was just fantasy. The porting was changed to deliver power more smoothly. The pipe was tucked in better, and the bike got a kickstand and an 18-inch rear wheel. Yamaha left the buyer to finish the job. If he wants a big gas tank, the aftermarket already has one. Same with handguards. With the off-road equipment that comes stock, the YZ250X gained only a little weight over the MX version and comes in at 219 pounds. 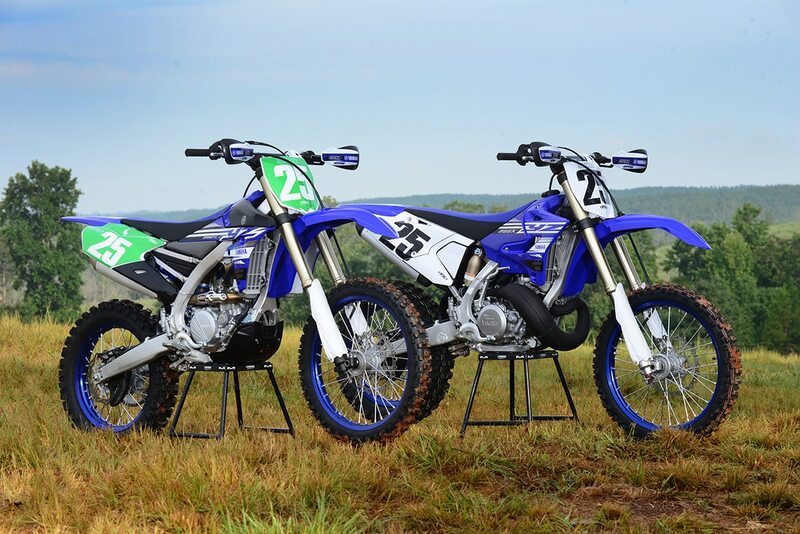 The fact that Yamaha even offers the YZ250X is a major victory for two-stroke lovers. Apparently, Yamaha has a bunch of those in-house. For this test we decided not to use our usual test locations and instead took the opportunity to venture into the woods of the Deep South. 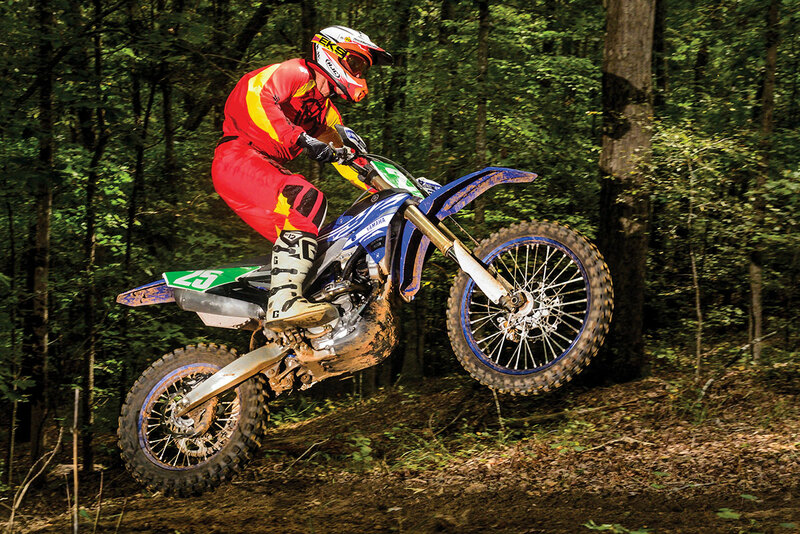 Randy Hawkins runs the AmPro Yamaha off-road race team out of his home in Travelers Rest, South Carolina, and he has property in nearby Union where his riders test and train. We took the X and the FX there for a mix of tight trails and fast two-trackers. There’s nothing new about two-stroke versus four-stroke comparisons. They happen every weekend in the off-road world. It’s called racing. The XC2 class in GNCC racing is blind as to whether you ride a two-stroke or a four-stroke. Same goes for the 250 class in Big 6 Racing out west. In both venues, it works out to a half-and-half split. Our South Carolina testing wasn’t designed to render a final verdict in the matter, but it did shed light on the strengths and weaknesses of each approach. To get the obvious out of the way first, there’s a big weight difference between the two bikes. The two-stroke weighs about 20 pounds less. The electric starter is at the root of that, not cams and valves. That’s a very big deal when you get into the woods. The two-stroke can be manhandled much more easily. This really comes into play when the trails are so tight that you physically have to yank the front wheel out of the bushes and mud. You don’t run into that situation nearly as often out west. Whenever the speed is under 20 mph or so, the FX’s weight becomes a big factor. You are only reminded when it comes to steep downhills where it’s hard to slow down. Next on the win list for the two-stroke is power. The X makes much more power than the FX. You don’t need a dyno to know that on peak, the two-stroke is about 20 percent stronger; however, neither bike is as powerful as its motocross counterpart. They both have been tweaked for more low end and smoother delivery, but this seems to hurt the four-stroke more. In GP races in the west, we’ve found that the FX actually struggles to pull top gear unless the dirt is very hardpacked and flat. In the same conditions, the X gets up to top speed easily. The only real advantage to the four-stroke’s tall sixth gear is for long trail rides where you want to upshift and cruise in comfort. On a dirt road at speed, the two-stroke vibrates more and the engine buzz will take a toll. The four-stroke might suffer in power output, but that doesn’t always translate into forward motion. As everyone probably knows by now, four-strokes hook up. 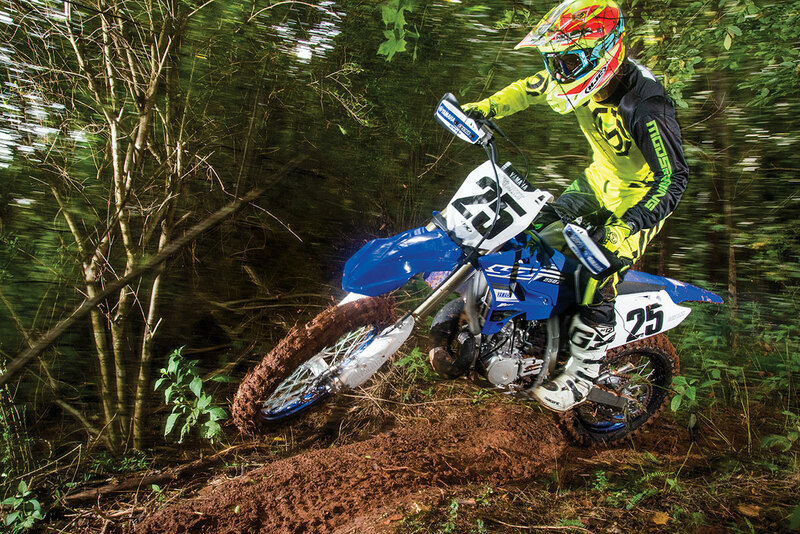 The YZ250FX finds traction in the worst conditions. Skeptics like to point out that this is a natural result of more weight and less power, but it goes way beyond that. The FX’s powerband is super wide without any real hit, whereas the X can be a real handful. Where the dirt is perfect and traction is good, a hard, comparatively brief surge of power is fine, but that’s not the real world. The FX’s long, even pulling power makes it a much easier bike to ride, despite the additional weight. It’s much harder to explain the FX’s next trump card. It has better suspension. The four-stroke’s fork and shock do a much better job of sucking up rocks, roots and whoops at any speed. How can this be when the two bikes have such similar suspension components? The two KYB SSS forks, in particular, are almost identical aside from the axle lugs. This isn’t the first time we’ve encountered this. Four-strokes seem to have an advantage across the board in suspension. We’ve theorized it has something to do with weight and traction, but in the end, the reasons don’t matter much. It’s just a fact of life. You can trade pros and cons like that all day. You can point out how the four-stroke’s electric starter can get you out of a jam. You can bring in the two-stroke’s ease of maintenance and lower cost ($7499 versus $7999). We can’t really say that one bike or the other has a universal advantage as a racer until you know exactly where the race is taking place. Conditions vary and can favor either bike on a given day. When the two-stroke guys and the four-stroke guys lay down their swords at the end of the day, though, it’s still about having fun. 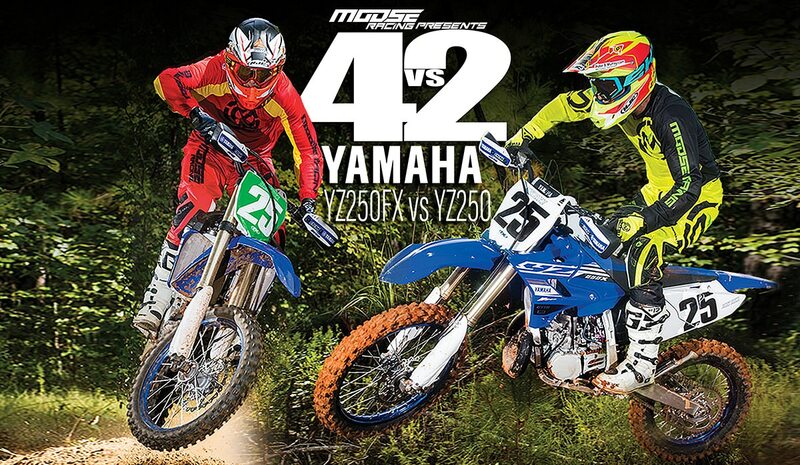 In this particular episode of the ongoing war of the strokes, we have to say that the YZ250X is more fun. It’s not easier to ride, and it’s certainly not more technologically sophisticated, but it can make you smile. That’s worth a lot of trophies. For a Dirt Bike Magazine 2 vs 4 video click here or the image above.